Let us show You the city from a unique perspective! Krakow horse drawn carriages were lauded in poetry (You would probably love the poem ‘The enchanted carriage’ written by famous Polish dreamer, Konstanty I. Gałczyński!). Nowadays, they permanently etched into the landscape of the Old Town and became one of the biggest tourist attractions. Join us and feel like a 19th-century burgher in his coach! Our route leads from the Matejko Square to the Wawel Hill (through St. Florian’s street, the Main Square, Grodzka and Kanonicza streets). 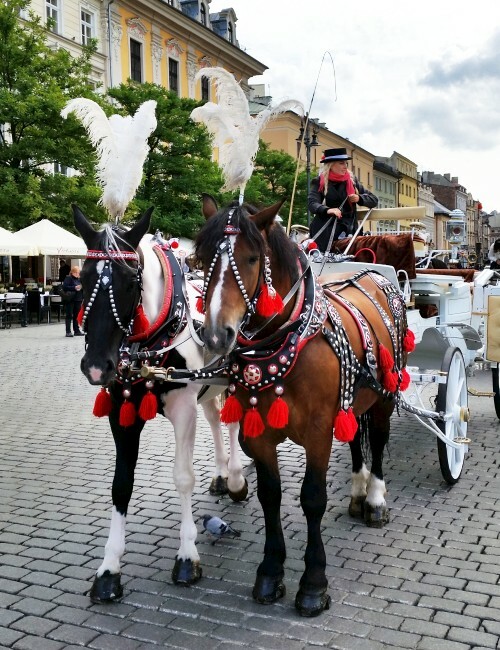 During this magical ride, while the soft clop of the hooves on the pavement carries down the street, You can admire remains of medieval Krakow fortifications, St. Mary’s Basilica, the Renaissance Cloth Hall or the magnificent baroque church of Saints Peter and Paul. All this, drinking in the unique atmosphere of old Krakow! A carriage can accommodate from 4 to 5 persons. Hiring one vehicle costs from 400 PLN per hour. Thanks to special sound system with a transmitter and headphones our guides can be heard in several cabs, so we can invite for this unique Krakow tour even 30-person group! We highly recommend this comfortable and probably the most romantic way of Krakow sightseeing. Decide on this magical experience! Tour adjusted to the age, interest and needs. Your anticipation will be our top priority! We meet in front of St. Florian’s church, a beautiful, baroque temple. There was a starting point of the Royal Route – ancient trail of royal processions. Nowadays, not the kings but our guides and visitors start here an amazing carriage ride around Krakow. You will see the relics of the medieval city walls – the Krakow Barbican (an outpost solidly fortified in the 15th century) and the only preserved of the city gates – 14th-century St. Florian’s Gate. One of the main streets of the Old Town from the Middle Ages. We have the opportunity to admire the great architecture of townhouses from our enchanted carriage (famous poem, that we mentioned, tells of the magic cab on this exact street!). The heart of the city beats right here! A huge, breath-taking urban space. At first we will see a grand, impressive block of St. Mary’s Church, then You will be delighted by subtle Renaissance architecture of the Cloth Hall and raw medieval charm of the Town Hall Tower. The flocks of pigeons flying up in the sky, street musicians, mimes – the atmosphere in this magic place is truly amazing. The oldest example of Baroque architecture in Krakow situated near the charming Romanesque church of St. Andrew. The sight of these two temples in perspective of the oldest and most beautiful Krakow street stays in memory for a long time. Right next to the church of Saints Peter and Paul, our cab turns into Kanonicza – a charming, narrow medieval street leading straight to the Wawel Hill. Houses You can see along the road was once a place of residence of the cathedral canons. 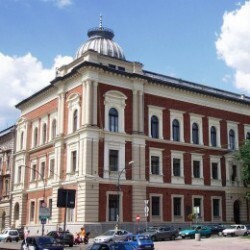 In the 20th century the future Pope John Paul II lived here. On the hill You can see magnificent centuries-old castle of Polish kings and the impressive Gothic cathedral, whose interiors hides not only the royal tombs, but also many wonderful works of art and some historical and spiritual treasures. Monumental buildings piled up on the hill make a great impression.